The silence of the deceased often becomes transferred into the muteness or paralysis of the living and in some ways Fairclough’s installation is the sound of muteness, of what poet Tomas Transtromer calls ‘music’s voiceless half’: the silencing sound of grief when only some kind of inhuman howl can release the pain. to wash it in the river where it will be carried away by the natural flow of source to shore. But then this is the Severn River, where twice a day nature reverses itself and the sea enters the river, charging in a massive surge upstream towards the source, confounding the bucolic calm and hijacking the contemplative passage of river-time. Inspired by Alice Oswald’s two poetry collections, Sleepwalk on the Severn and Dart, Fairclough responded to the counter-intuitive movement of the bore, using it as a powerful metaphor for the inconceivability of death itself. In Bore Song, 2011, she films a young woman by the banks of the Severn, emitting a single note to battle against the roar of the wave, appearing both to emerge from within it and rage against it at the same time. We are of death and yet always believe we are beyond it. The single note sounds almost mechanical and Fairclough explains that she asked the actress to mimic the pitch of the sound that once marked the end of transmission of analogue TV broadcasts. It evinces a familiar, uncompromising finality. Fairclough uses the mystery of the bore phenomenon to great effect. In a fairly tight mid-shot, it is hard to tell whether we are looking at a sea or a lake reflecting trees. When the wave passes it does not collapse but continues, leaving swollen turbulence and a shattered reflection. The piece of glass onto which the image is projected increases the shimmering intangibility of the place and the visceral volatility of the persona’s emotional space. Her open mouth becomes a dark hole, a nothingness. There is something monstrous in the suspended 27 second loop: the unnaturalness of the wave, the uncanniness of the voice and the inexplicability of both. 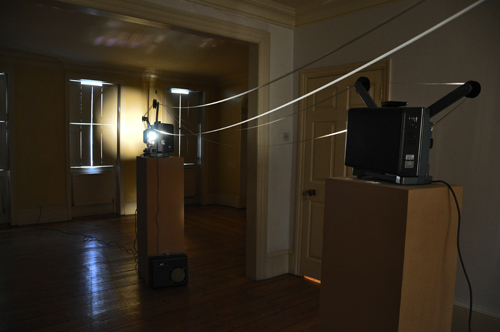 In Song of Grief, 2011, Fairclough augments this discord of expectations.3 She runs two 16mm projectors almost face to face, each projecting an empty frame on to the opposite wall and each projecting the same pitched note at different intervals. As in ‘Bore Song’, she has made the sound into a diagram using the film itself which is run upwards three metres to a spool near the ceiling on one projector and into the middle of the room about a metre from the other one. This elegant, vibrant criss-crossing acts as a sculpted soundscape, where the wave of Bore Song becomes the ribbons of belting strips of film, running imagelessly through the gallery. The 16mm film itself catches the light, quivers as if battered by the wailing sound, as if trying to measure the height, depth and width of grief itself - something digital sound and projection could not attempt. But Fairclough’s return to analogue is not nostalgic rather she employs the racket of the standing-off machines to heighten the wearying, pointless repetition – an apt metaphor for the tireless assault of bereavement on the body and the defiant refusal to submit to its rules, its truth. She was also drawn to the perishable, degradable quality of the celluloid itself as its life too is finite. Walk into the beam of light and you appear as a dark ghost on the wall; turn towards the light and you are blinded. This experiential interaction with the work induces the metaphysical tussle between the darkening, featureless despair and the illuminating insight that sorrow can bestow. The wild fury of the piece encapsulates the rage of separation and futility of death and gives over to the permission to howl and to keep howling. The blank frames accentuate the absence but also the eradication of the memory of the absent one. If the blankness replicates the loss, the noise activates it. Unresolved, unresolvable, this arduous, staggering blast of a work invents a sculptural space for grief to do its exhaustive and exhausting work. In her latest work, entitled Deep Grief, 2009-2011, Fairclough has worked with sound artist and musician Mikhail Karikis to explore an idea she conceived at the start of this project. She wanted to overcome the width of the river by throwing a shout across it. Recorded on one river bank on a radio mic and on the other via a boom, the sound moves on from the oppositional anger of Song of Grief into a call and response, as if the deceased could answer back, as though the howl could be heard beyond the booming surge of the bore and transcend the reaches of the Styx itself. Synchronised on one loop via two projectors, the material representation of the work also suggests an appeasement of the conflicting arguments with death and the deceased. In many ways, the series of drawings4 act as a softly creeping calendar of grief, from the early diptych drawings of the tent Refuge and Prospect, 2009, through to its virtual erasure in the liminal and tender portrait, Untitled, 2010. The hunkered down physicality of the guy ropes and metal frames of the tent are echoed in the V-shapes Fairclough constructed from the film itself as if her tent provided the sanctuary that the filmic space could not. One image of the tent looks sculpted from grassy earth itself as if to convey her wish to be buried too. The guy ropes seem to suggest the importance of remaining tied to the ground rather than floating off into ephemerality. Another tent resembles a verdant breast, invoking the missing, grieved body. Grief makes us shrivel, shrink, pare away the extraneous. Fairclough evokes this hermit, protective instinct profoundly in her articulate, spare, poignant images. The two final drawings Unstuff and Stuff, 2011, stand in for the body freeing itself from cocooning bereavement. The portrait of the sleeping bag, ‘Unstuff’, looks like a shed snake-skin. It has none of the taut, hurt urgency of the earlier images and seems to physically carry the traces and stains of human fluids – whether they be sweat or tears - as if they themselves were the material of the drawing rather than pencil and watercolour. ‘Stuff’ on the other hand, shows the rolled up, bagged sleeping bag and conjures the caked consistency of mud. It provides a final, robust image in the process of recovery and reconciliation. The grief has become portable. ‘The supernatural is only the natural disclosed’ wrote poet Lucie Brock‐Broido. In Ground Truth Fairclough has used the magic, unreal, elemental nature of the Severn bore and the physical experience of sleeping by the river to disclose the vulnerability and resilience grief offers. Her striking work bridges the documentary and the conceptual, extends the conventional connectedness of image and sound in ways that recall the work of artists like Felix Gonzalez-Torres, Ana Mendieta and experimental film-makers like Lis Rhodes. 6 Thomas A. Clark, Distance and Proximity, pocketbooks, Edinburgh, 2000, University of Social Sciences, Łódź, Poland. This text was written on the occasion of Louisa Fairclough's solo exhibition Ground Truth, at Danielle Arnaud Gallery, 2011.